Here's a trailer and artwork for director Vito Trabucco's homage to The Twilight Zone and The Outer Limits. Writer-director Vito Trabucco (Bloody Bloody Bible Camp) and writer-producer Christopher Maltauro have created a chilling homage to the twisted and otherworldly tales of the original Twilight Zone, Outer Limits and Alfred Hitchcock Presents series. 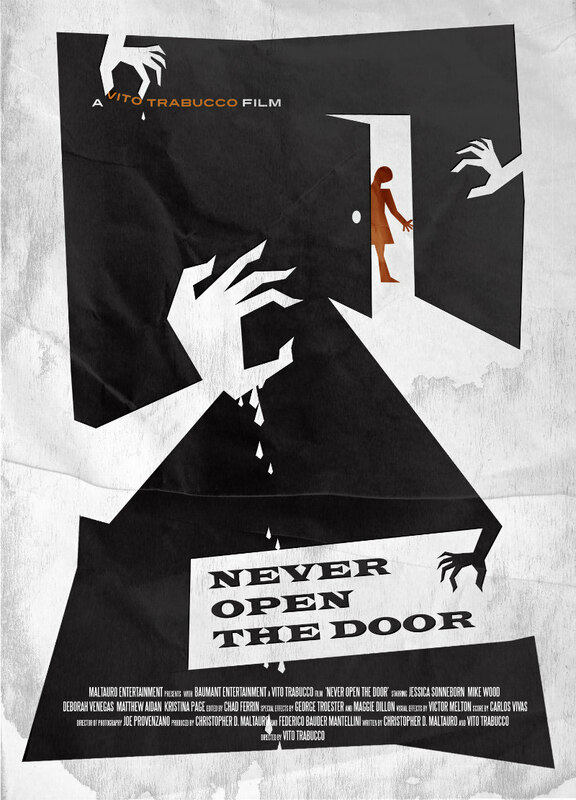 Never Open the Door will be available to rent or own starting December 6th on Amazon Instant Video and Google Play. Never Open the Door stars Jessica Sonneborn (Dog Eat Dog, House Across The Street), Kristina Page (The Haunting of Alice D), George Troester (Face Off) and Deborah Venegas (Bloody Bloody Bible Camp).